Raising a healthy child—spiritually and physically—may well begin before their first genes are created. Renowned teacher Jocelyn Gordon shares why, and how. 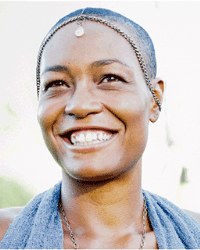 Jocelyn Gordon is the creator of HoopYogini™ and Bhakti Boogie® Yoga. Catch her at Wanderlust Snowshoe, Wanderlust Stratton, Wanderlust Squaw Valley (look out for Jocelyn’s Conscious Conception Circle at Squaw), and the Los Angeles, Minneapolis, Brooklyn, Washington DC and Tampa 108s. They ask you to love yourself exquisitely right now. My journey and experience with conscious conception began 13 years ago when my first daughter was five. The energy that I considered my daughter-to-be became an awareness to me felt on the right side of my body. Family members and dear friends will tell you that, at this time of my life, I spoke often about the child that would come when I met my divine right partner. My background—and current work—is dedicated to lineage-healing that addresses patterns of pain and power within the mother line. At the time that I began to feel my daughter-to-be, I had recently deepened my healing path and journey with healing arts, and was drawn to study prenatal yoga and massage. I’d had the honor to support several pregnant women with movement, meditation, and massage that helped them avoid stressful interventions and to experience more peaceful birth outcomes. Fast forward—Sienna is here, a beam of joy, light and intelligence. She was long awaited and has a deep sense of self and self-love. She is abundantly healthy, highly observant, emotionally aware, caring and fun. Conscious Conception is a holistic path of preparing your body, mind and spirit, lifestyle, home and relations for the miracles of pregnancy and childbirth, along with the responsibilities of parenting and householding. A conscious conception journey can start three to four months before conception and is ideally initiated a year a more before actively trying to conceive. Whether or not you choose to give birth to human form, conscious conception invites you to be in relationship with the energy that wishes to be born through you. This teaches clarity in order to become more open and aligned to manifest—to give birth to—co-creative energy/spirit. This relationship supports the fulfillment of the highest intentions possible for both you and the energy wishing to come through you. I believe that our children—or “spirit babies,” a baby, book, project, work of art, etc.—can act as teachers. The powerful initiation of pregnancy and birth only reaffirmed my belief that spirit babies resonate as intelligence without form, and act as guides helping us to evolve (personally and globally) into our next expression of creativity, health, harmony and joy. Epigenetics is the study of how biological markers affect our genes and thus our health, and posits that our choices, environments, and exposures affect our personal health and that of our progeny. Trust in the theory fueled me with the determination to create the healthiest me in body, mind, and spirit, so that I could create the most vibrant field of physical health and energy supporting the health, longevity and vibrancy of my future child and her children. Conscious conception invites you to be in relationship with the energy that wishes to be born through you. Studies show that environmental stimuli, stressful and traumatic experiences, the food we eat and our access to it, have the ability to activate or silence genes. There is evidence that weight gain, addictions, exposures to pollutants, fitness level, the quality of thoughts and the people in one’s life, have intergenerational affects on how cells function, how one behaves and their responses to stress. Yogic philosophy describes annamaya kosha, the food body, and states that the quality of a human’s physical health is determined by the quality of the sperm and ovum at the point of conception. This spiritual theory, alongside the science of epigenetics, encourages thoughtful parents to prepare months to years before conception. This can be done by analyzing lifestyle choices (Do you smoke? How often to you drink alcohol? ); assessing environmental exposures (Do you work or live around dangerous chemicals? What kinds of pans do you use for cooking? What types of substances do you use to clean your home? ); and modifying behaviors while increasing wellness factors (meditating, getting adequate sleep, exercising regularly, addressing unresolved trauma). This kind of preparation can activate healthy gene responses. There is a global awakening towards ecology and Earth stewardship. This manifests as respect for the Earth and her resources, respect of the power of sexuality and creative life force, respect of the feminine, and/or respect of the child and innocence. These are each ways we can contribute to a peaceful and harmonious experience for all of Earth citizens, for generations to come. Ancient Iroquois wisdom encourages us to measure our decisions today on how they bear fruit seven generations into the future. This Seven Generations perspective invites us to make sustainable choices in all areas of our life—financial, spiritual, physical, political, communal/relational—with the perspective of analyzing how our decisions affect our descendants. Do your emotional and spiritual housekeeping so you can vibrate higher and call in more consciousness on the planet. Conscious Conception embraces that the children we dream today—our ancestors and the future leaders, activists, parents and Earth stewards of tomorrow—are influenced by our current choices. This ranges from food to partners, from thoughts to the environment, and beyond. We are empowered now to nourish seeds for their longevity, health, harmony and clarity of purpose. Vibration is the subtle energy that informs and infuses matter. As we dedicate ourselves to creating healthier bodies, caring for our inner and outer environments, may we also intend to elevate the vibration and consciousness of the planet by addressing our own past trauma, emotional wounds, outdated beliefs, and painful patterns of thinking and being. Allow your spiritual and energetic hygiene practices of yoga and meditation—plus time in nature mixed with therapeutic support—to help you navigate shadow and to bring more understanding, light and forgiveness into your heart. The generations coming forward today require parents that have addressed emotional density, that are awake and awakening, conscious and perceptive, courageous and strong. Do your emotional and spiritual housekeeping so you can vibrate higher and call in more consciousness on the planet. If you have received the call to become a mother/parent, you have been called into a deep and personal transformation that has familial, spiritual and planetary ripples. Relax fear. Embrace excitement and wonder. You are empowered! What are you choosing right now? Participate in Jocelyn’s Conscious Conception Circle at Wanderlust Squaw Valley! Jocelyn Gordon is a world traveling mama, dance enthusiast, and peaceful birth advocate. As a Women’s Health Coach specializing in Pre-Conception Preparation, Jocelyn helps women and couples up-level their health and consciousness before conception and during pregnancy. She’s also the creatress of two ecstatic embodiment practices that merge yoga with dance, prayer and mindfulness meditation—HoopYogini™ and Bhakti Boogie® Yoga. She teaches internationally, mentors her instructor tribe of over 100 HoopYoginis and navigates the waves the householding, child-raising and entrepreneurship. Receive guidance on Conscious Conception and connect with Jocelyn on her website, Facebook, and Instagram.